Happy hump day! I hope your week is going well. Have you started your Christmas cards yet? It is hard to believe that it is already October. Thanks to Christmas at Sweet Stampin' I already have a stack of Christmas cards prepared :) A new challenge starts today, and it is a good one - a card for a male. Eeeek! We all have men in our lives who (even though they may not admit it) enjoy getting a hand made card, and if you're anything like me, you put off making them until the last possible minute. They can be so tough! So this month, we hope to help you to get those male cards done early. The team has made some gorgeous cards to inspire you, so please do pop over and check them out. Then come and play! After much procrastinating, I finally opted to make a sappy card for my hubby. He says he likes funny cards, but I think he will like this one too. It looks so gorgeous IRL. If you pop over to Jessi's blog, you can find all the details for getting your very own mats. Stamps - Warm Winter Wishes by Sugar Nellie, stamped on 300g hot pressed watercolour paper and coloured with Distress inks (black soot, tattered rose, faded jeans, broken china, wild honey) and embellished with polar white flower soft. 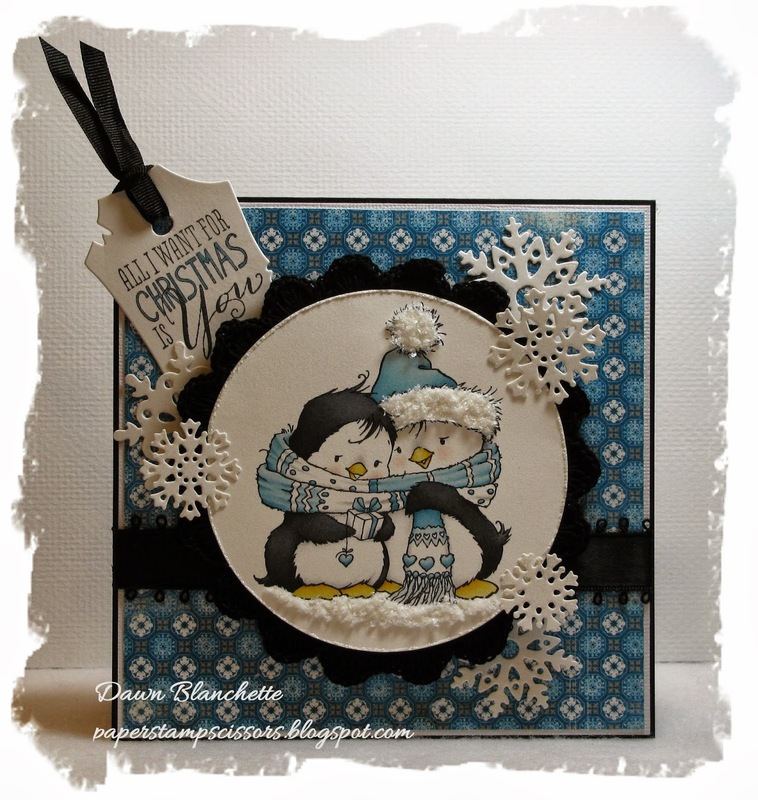 Sentiment is from the Christmas Messages set by Stampin' Up! We have a fantastic sponsor again this month - My Mum's Craft Shop will be giving a £10 voucher to one lucky winner!! Thanks so much for stopping by and for taking the time to leave a comment. I appreciate each one and will do my best to catch up with you as soon as possible. Soooo cute Dawn! I love your image choice and all those snowflakes! eek! You used one! And you made it SHINE just like I knew you would :) Thanks so much for the shout-out, Dawn!! Love the Flower Soft fuzzies - so perfect - and awwwww on the sweetness for your hubby :) Mine would probably faint if I was that nice to him! Ahh this is an adorable Christmas card Dawn, I love the cute image and beautiful background paper. Oh my gosh! Is there anything cuter than cuddling penguins!! I had to look up what you used to make the fluffy hat and snow - so effective! Jessie's mat is a perfect frame! Gorgeous card Dawn, the image is adorable and beautifully coloured. Such a gorgeous card Dawn!